Sometimes, living with a medical condition can put a real damper on your evening plans, but it doesn’t have to. 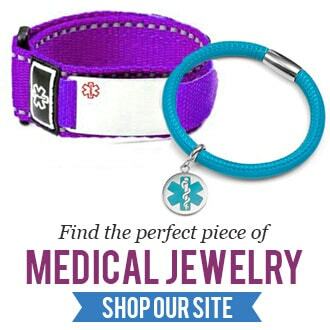 Medical jewelry is being designed now to appear very similar to everyday wear jewelry so that it doesn’t look hideous, while still ensuring it’ll stand out just enough to alert first responders just in case you run into a health emergency during a night out. Read below for our list of 9 modern clothing styles and medical ID jewelry selections to match! If your celebrity fashion crushes include Justin Timberlake, Kylie Jenner, and Taylor Swift – one thing you’ll notice they all have in common is the use of black and white. You can do a solid job of re-creating some of their celebrity looks with the use of black skinny jeans, white tee shirts, and crop tops. Add in a black leather medical bracelet with white laser engraving to complete your look and your ensemble will copy that of the most famous celebs all while still making sure that you’re safe during your evening outings! The inherent beauty found in a little black dress is its ability to go with just about anything, including medical jewelry. Gold and silver, black leather and steel medical ID’s will all serve to enhance your simplistic style in your LBD. If your night out includes a quiet picnic at the beach and your look needs to be a bit more casual, but you still want to maintain your chic appearance, then skinny jeans, boots, and flannel may be the best choice for you. A soft, brown leather medical bracelet will give the comfortable touch you need to complete your look. On hot summer nights, we wear white! White dresses, white pants, white shorts, white halters, white crop tops, white sandals, white sneakers, and white leather medical alert bracelets. White is a statement look that speaks for itself by saying– I’m confident and classy. Maybe it’s Friday night and you’ve worked long hours all week, requiring you to sleep little and run around, a lot. If a chill, easy going night is what your doctor’s recommending – than an easy flowin’ outfit is the right choice for you. To nail the easy flowin’ look – you’ll need loose-fitting clothing that breathes, but of course, is still tailored to fit your body type. Flowy tube tops and breezy summer dresses are perfect for the ladies, and loose fitting button down cotton shirts or tanks paired with shorts and sandals for the guys are an absolute must. Add your easy adjust drawstring hemp or macrame ID jewelry and you’ll be all set for a night of chillaxing. Let a night out on the town be your time to blaze — in a sizzling hot outfit that is! Enjoy the casualty and freedom of being out of work mode and into a night of liberty mode. Rock your leather skinny jeans and pair them with a skin showing crop top halter or off the shoulder plunging neckline blouse. If you’re going to be showing off some extra skin, then it’s a good plan to wear minimalist style ID jewelry. Select a slim bar style medical ID necklace or a petite hanging pendant finely engraving to show your medical condition and special instructions for care. Silk never goes out of style. Actually, it cycles back through rather frequently. Silk dresses and blouses are a popular choice for an elegant night out either for a date to see a show or to try a new restaurant with a dress code policy. Silk isn’t just for the ladies, men’s long sleeve shirts are available in deep hues of fine silks to look fabulous and to feel amazing against the skin. To better accompany these finer fabrics, when picking your medical ID jewelry, you’ll want to look for styles that accentuate the silk with its own fine adornments. Medical pendants with diamonds, gemstones, and charms add beautifully to intricate silk fashions. For those who simply must get all dolled up in the most super of the super glam, you’re used to going all out with your outfit, with your hair & make-up, and with your accessories. For a fun night out, put on your flashy new dress, your most fabulous pair of heals, highlight and contrast those cheekbones and get your hair looking shiny and fresh. One of the best ways to compliment a super glam look with your ID jewelry this year is to utilize a little trick called layering. Layer necklaces, layer bracelets and stack your rings all while incorporating some strategically placed bling! Choose smaller medical ID jewelry pieces like thin necklaces and minimalist bracelets to easily mix into your stack of layered accessories. This last category is for all the fly guys out there who are spending their evenings out with friends, with their family or with their significant others. Men like to dress nicely too. A popular look that says “you’re fabulous man” is actually quite easy to pull together and it involves a slick pair of slacks accompanied by a long sleeve dress shirt or a simple button down. Even a pair of dark denim jeans with a fresh new tee with a witty print on the front or back works great. For all these fabulous men, medical jewelry can be purchased in steel and leather styles to accentuate your swagger. And, there you have it, for standout evening ensemble looks that are both modern and attractive, there’s medical ID jewelry for that! Happy Shopping!